Growing up right next to the Brecon Beacons, a stunning national park in Wales (UK), meant spending a lot of my school trips in the mountains. Mostly, we were given orienteering challenges. The aim was to cross unknown places to find certain spots or hidden items. I was terrible at it. I always got lost. I learnt very quickly how difficult it can be to orientate yourself, especially when you're tired, with a group or in stressful situations. Whenever you head outdoors, having a good plan and reacting to changing conditions requires a good understanding of how to navigate the terrain you travelling on. Sometimes we need to confirm we're on the right track or follow a particular trail while riding. However, more often than not, we just need to course-correct after getting ourselves a little lost. Which way am I heading? Where or in what direction is my next waypoint or final destination? We've been thinking a lot about how FATMAP can help on-the-trail navigation and in our latest update have added a few features we think will help quickly and easily answer those questions. In your FATMAP app, you'll always see this red circle icon. You can think of this icon as both a location marker and digital compass. Locate your position (single tap when not centred on your position). Display the direction you're facing (with a red fan). Lock to your position, point the map in the direction you're heading and follow you (lock-and-follow mode - double tap icon to activate). Show your location relative to the area you're exploring. Display how accurate your position fix is at that time (using a large red halo). Even in airplane mode or when using your offline maps, the GPS of your device will work with FATMAP so you'll always be able to use these features. Probably the most exciting part of this new update, the new lock-and-follow mode makes following a route super simple. 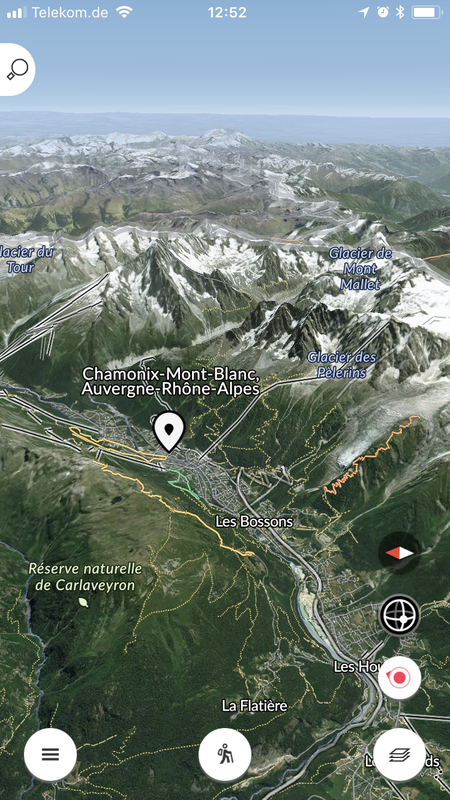 Whether you're charging down flowy single-tracks or casually hiking in the Swiss Alps, the location marker will display your exact location (depending on the quality of your device's GPS unit and coverage), the map will point in the direction you're heading and follow you as you move. Simply double tap the location icon to activate and start exploring. In the video below, you can see this feature in action. As we've mentioned, you can always tap the icon to centre the map on your exact location but there are a couple of handy features built in to help you really understand where you are and where you're heading. In the first screenshot, you can see the location marker from our Berlin office. The red 'fan' indicates the direction we're facing while the red 'halo' that surrounds it indicates a current estimate of how accurate the GPS signal is. If your icon is grey, then it means your position has not yet been fixed. In the second screenshot, you can see the location marker is pointing in a particular direction. When your location isn't on the screen, it'll display the direction of your location. This can be super handy when looking around your immediate location looking for your next peak or trail. We'd love to hear what you think about the new navigation updates. Just drop us an email at hello@fatmap.com and let us know your thoughts!